You heard that! 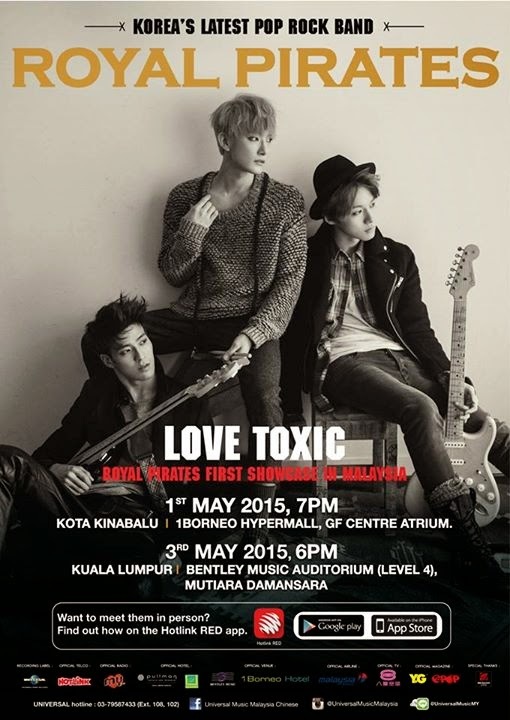 Royal Pirates is finally coming to Malaysia for the promotion of their latest album 'Love Toxic'! Royal Pirates, a Korean – American rock band, is coming to Malaysia on 1st of May for promotion of their latest album 'Love Toxic'. This is their very first time coming to Malaysia to meet their fans, all of whom will be able to enjoy their live performance through their 'Love Toxic' showcase in East Malaysia & Peninsular Malaysia. Royal Pirates consists of guitarist-vocalist Moon, drummer Soo-Yoon and bassist James. Since September in 2008, Royal Pirates gained popularity on YouTube by uploading covers of songs such as Nobody by Wonder Girls, Circus by Britney Spears, Mirotic by DBSK and more. They reached 18,000 viewers within two weeks. Additionally, they covered “Sorry Sorry” by Super Junior, after which they received an invitation to appear on a show, which helped them gain further popularity. In August 2013, Royal Pirates released a digital single - 'Shout Out'. With a successful debut of their mini album 'Drawing The Line' in January 2014, Royal Pirates released their second mini album 'Love Toxic' in August. The album include five songs which comprises by three new songs and two English versions of their singles 'Betting Everything' & 'You' which was released earlier on. Beginning January 2014, Royal Pirates were special guests for Lee Min Ho’s global concert tour. The wait is finally over, and now Royal Pirates is finally coming to Malaysia to meet their fans with 'Love Toxic' showcase + autograph session in East Malaysia and Peninsular Malaysia. Their first showcase will be on 1st May, 7pm at 1Borneo Hypermall, GF Centre Atrium, Kota Kinabalu. The next showcase will be on 3rd May, 6pm at Level 4, Bentley Music Damansara. From 13th April onwards, customers who purchase Royal Pirates latest mini album 'Love Toxic' in selected CD-RAMA will be entitled to two showcase passes to attend 'Love Toxic' showcase at Bentley Music Auditorium, Mutiara Damansara. Entrance is on a first come first served basis. Hotlink is taking its ‪#‎LiveLifeLoud‬ experience one step further by giving fans of Royal Pirates, a chance to watch them perform live and even hang out with the band. As part of Royal Pirates’s first ever showcase here in Malaysia, Hotlink has introduced a contest where customers can win tickets to their showcase in Kota Kinabalu on 1 May and in Kuala Lumpur on 3 May, as well as enjoy a special up close and personal experience with the band. The contest will run until 22 April. • Participants are allowed to submit more than one entry.